ESTE COM 9 FLORES NA MINHA COR PREFERIDA. ESTA É OUTRA DAS MANEIRAS PARA SE FAZEREM PULSEIRAS. VAI-SE ALTERNANDO AS CORES QUE SE QUEREM E TAMBÉM SE PODE FAZER O ANEL IGUAL. AQUI ESTÁ A PULSEIRA QUE FAZ CONJUNTO COM O ANEL JÁ COLOCADO TAMBÉM NÃO FICOU MUITO MAL E TAMBÉM DÁ PARA FAZER DE VARIAS CORES. AQUI ESTÃO MAIS TRÊS ANEIS E TAMBÉM DE CORES DIFERENTES. 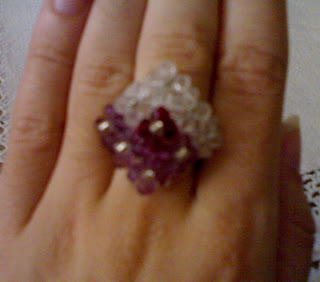 MAIS TRES ANEIS COM CRISTAIS SWAROVSKIS, MAS DE CORES DIFERENTES. ESTE TENHO QUE DIZER QUE É DOS MEUS FAVORITOS. FOI FEITO COM CRISTAIS DE COR AURORA BOREALE E AMETISTA AB. TAMBEM GOSTO DESTE GENERO. DÁ PARA FAZER TAMBÉM DE VÁRIAS CORES E TAMBEM CONJUNTO COM UMA PULSEIRA. ESTES ANEIS FICAM BEM PARA QUEM TEM DEDOS COMPRIDOS(COMO EU) GERALMENTE SÃO DOS QUE GOSTO MAIS. ESTE ANEL FOI FEITO COM CRISTAIS SWAROVSKI. DÁ PARA FAZER COM IMENSAS CORES E DE VÁRIOS FEITIOS. EM BREVE COLOCO MAIS.